As head coach David Quinn said, there’s no time to dissect every little detail of the 3-1 loss at Lawler Rink. What BU can do, though, is find ways to counter Merrimack’s physical style. 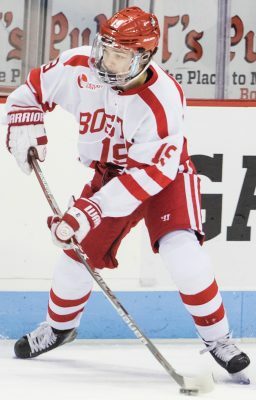 It caused the Terriers fits on Tuesday, especially in taking away space from creative players such as freshman forward Patrick Harper and sophomore forward Jakob Forsbacka Karlsson. The larger surface at Agganis should afford them more scoring opportunities, but Collin Delia, the Warriors’ netminder, showed he’s no slouch, as he posted 30 saves against BU. With some home cooking in order, however, Quinn remains confident that his squad can reverse its fortunes against Merrimack. While Friday’s tilt poses its own challenge, Lowell’s (15-7-3, 7-5-1 Hockey East) visit represents an entirely different animal. The River Hawks sit tied for fifth place in the conference standings — three slots behind BU — and are as complete a team Quinn and his players will face all season. For starters, Lowell’s goaltender, Tyler Wall, boasts a .921 save percentage and has eased the loss of Kevin Boyle to the Anaheim Duck’s organization. The River Hawks’ strength, however, might lie in a quartet of upperclassmen that are tried and true Hockey East stalwarts. Forwards Joe Gambardella, John Edwardh and C.J. Smith and defenseman Dylan Zink all have surpassed the 20-point mark. The key player is Gambardella, whose 34 points is tied for eighth-best in the nation. Keeping with the national picture, Lowell shines on special teams. Its success rate on the powerplay (24.35 percent) is fourth-best in the NCAA, while its penalty kill success rate (85.9 percent) is 12th-best in the country. As much as Roberto praised Lowell, several elements are falling into place that should help the Terriers slowly return to their winning ways. They’re 8-1-1 at home, freshman goaltender Jake Oettinger will be returning to the pipes against Merrimack and freshman forward Clayton Keller owns an 11-game point streak. Junior forward Nikolas Olsson should feature, too, Quinn said, after he missed Tuesday’s game with an upper-body injury. All things considered, then, Roberto didn’t hold back when explaining what BU’s mentality must be. Carpenter, meanwhile, echoed much of the same.